Play Temple of Iris Jackpot! Spin to win 15 free bonus games for triple prizes. Match 5 priestesses to secure the fortune! 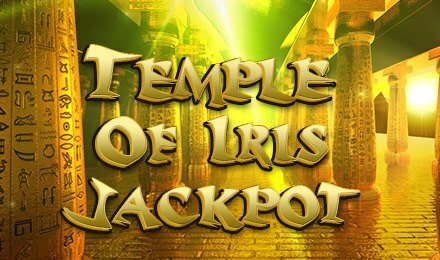 Temple of Iris Jackpot has an authentic Ancient Egyptian theme which, combined with its progressive jackpot potential makes is great fun. The symbols across the reels have a fantasy feel with hieroglyphics, relics, as well as your classics Aces, Kings and Jacks of a regular slot machine. Take an adventure with the Ancient Egyptians and play Temple of Iris Jackpot, featuring 25 paylines across 5 reels. The Priestess is the Wild symbol. The slot also features a fantastic bonus round, when you line up at least three Golden Pyramids Scatter symbols across winning lines on your reels. The bonus round is a simple free spins round, with up to 15 free to be won. Picking up the Priestess during the bonus will result in double the winnings. If you line up just two Golden Pyramids you’ll also get your whole bet back. This slot game combines fun play ability and straightforward bonus features making it great fun. The ancient Egyptian theme adds a touch of adventure which sets it apart from other slot machines. The progressive jackpot on offer makes it a great choice for high rollers.